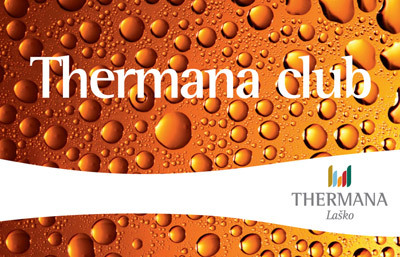 The Gold Card and with it the membership in the Thermana Club can be acquired by a person older than 15 years who correctly fills out the membership form and pays the annual membership fee of 40 €. The membership fee has to be settled prior to the use of the benefits for members. It is valid for one year from the payment of the fee, the benefits are valid immediately. 5 % discount on catering services (at one time purchase of at least 100 € ). Discounts apply to the cardholder and his close family members. annual gatherings of the cardholders. 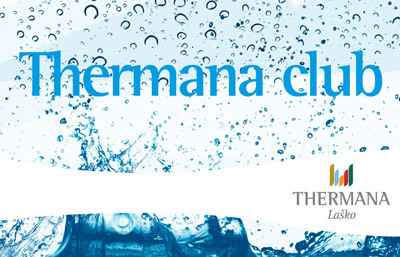 The issuer of the Golden and Blue Cards Thermana Club is Thermana d.d., the company for well-being, Zdraviliška cesta 6, 3270 Laško, Slovenia (>Thermana d.d.c). A Golden Card can get natural persons over 15 years of age, who correctly fill out the form for the issue of the card. For the Golden Card it is necessary to pay a subscription fee each year, which is decided on at the beginning of each calendar year, while the Blue Card is free of charge. The issue of the card to legal persons is not possible. The card may only be used by its holder and is not transferable. It is possible to get the card by giving a written request to the following sales places of Thermana d.d. : at the receptions of the hotels Thermana Park Laško, Zdravilišče Laško, at the reception of the Thermal Centre Thermana Park Laško, at the reception at the bath of the hotel Zdravilišče Laško and at the reception of the Wellness Spa Centre Thermana Park Laško, or by applying through the internet. The cardholder accepts with the delivery of the complete written request for the issue of the card to Thermana d.d., respectively with the delivery of the completed written request for the issue of the card via the internet, and in using the card, the general conditions of operations with the card. With every purchase in Thermana d.d. in the amount of at least 1 Euro, the card holders with submission of the club card at cashier and after successful transaction, obtain a certain number of points which bring benefits (points are collected with the purchase of services from regular price lists from pools, wellness and accommodation). The amount of acquired points depends on the value of the purchase, namely for each completed euro of purchase the cardholder gets one point. Acquired points are written to the card system, benefits are assigned at the end of the Profit period. Benefits in form of an electronic voucher may be used at the following purchase, till the end of the profit period. Benefits, to which the cardholder is entitled depend on the amount of points, collected on the card. Single benefits and the amount of points, necessary for their acquisition are published in the leaflet of the Thermana Club and on the web page www.thermana.si. At the end of each profit period, the cardholders receive the score according to certain criteria and an electronic voucher (an advantage at a certain value, loaded to the card), which gainers can utilise in the following Profit period. The amount of the purchase with the voucher has to be bigger than the value of the voucher. The value of the voucher is not added to the amount of purchases for the following accounting period. Collected points are transferred to the following period only for members, who did not collect enough points to be entitled to the bonuses. Transfer of points is possible only once. In case that also after the end of the second Profit period the member does not have collected enough points to be entitled to a bonus in the form of a voucher, the amount of points will be nullified. With all others the amount of points returns to 0 immediately after using the gift voucher. The total amount of points is written at each purchase on the purchase receipt. The holder has the possibility to check on his state of points also at the Internet pages www.thermana.si. Benefits may be validated by presenting card and received vouchers before payment is made. The exchange of benefits on the card for cash is not possible. Profit period: from 1.6. to 30.11. and from 1.12. to 31.5. Benefits, to which the cardholder is entitled, can be validated exclusively at Thermana d.d. Action in case of loss of the card: In case of loss or damage of the card replacement is possible by presenting any document with picture and a filled out form for the issue of a new card. The holder pays for the issue of a new card the amount of return payment for the issue of the new card. The holder is entitled to the points respectively the benefits, which he has acquired based on the lost or damaged card. We keep the membership data for as long as it is strictly necessary for achieving participation in the club for which they were processed. After that it is deleted. If there is an obligation of the company and / or a tax obligation to retain data, this is deleted after 5 years, unless it is otherwise provided by the regulations. Your data on points collected and the bonus will also be deleted. The card is issued for indefinite time, but the holder may at any time and without giving reasons cancel the card in written form. He has to cancel the card by registered mail, and together with the written cancellation he also has to return the card. The cancellation becomes valid, when Thermana d.d. receives the written cancellation and the card. Thermana d.d. may cancel the card at any time and without giving reasons, in written form by normal mail. In case, Thermana d.d. cancels the card, the cardholder is entitled to all benefits, that he has collected until the date of the written cancellation. Thermana d.d. reserves the right to changes of the terms of operations, the rules of the advancement system and other benefits, without explicit written notification of the holders. Terms of operations are published at the web pages www.thermana.si. We will carefully protect, process and handle the personal data you will provide us with in accordance with the GDPR and national legislation in the field of personal data protection. At each use of the card, data about the purchase of the cardholder is written to the card system (product resp. service, price of the product resp. service, height of the purchase). With the entry of his personal information on the web page and filling out the field on the web page, referring to the approval of using personal information (i.e. by entering a tick into the field) respectively oy entering personal information into the written registration form, as well as signing the declaration referring to the approval of using personal information, the cardholder gives his personal permission and approval, that all personal information, referring to him, and which are or will become known when operating the card, on the part of the carrier of the personal data, i.e. the company Thermana d.d., company of well- being, Zdraviliška cesta 6, 3270 Laško, may be restored, collected, managed, used, processed and saved for the purpose of marketing services, promotional activities, inclusive direct marketing and analysing operations with the card as well as analysing shopping habits. Here with the cardholder agrees and gives his personal permission that on the part of the carrier of personal information for needs of direct marketing all personal data can be used referring to him, and which are or will be known to the carrier in the framework of operations with the card, except sensible personal information. With the entry of his personal data on the web page and by filling out the field on the web pages, referring to the approval of use of the personal data (i.e. by clicking into this field) respectively with the entry of his personal data into the written form, as well as with his signature referring to the approval to use the personal data, the cardholder furthermore gives his personal permission and approval that the carrier of the personal information (Thermana d.d.) may communicate the personal data of the holder and about purchases made from the first paragraph, to other contract partners of the company Thermana d.d. with seat in the Republic of Slovenia, which are accordingly registered for processing personal data, and with whom Thermana d.d., has made according contracts about processing personal data, with the purpose of mediating personal data and data about purchases made at Thermana d.d., to the user of personal data with the purpose of managing a consistent base of cardholders and their personal data as well as their purchases made, with the purpose of doing marketing activities and with the purpose of doing an analysis of operations with the card, respectively shopping habits, as well as to printing shops (i) with seat in the Republic of Slovenia with the purpose of printing materials, connected to marketing activities of the carrier of personal data. Personal information will be processed in the region of the EC. Each cardholder can demand in written form sent to the address of the carrier of personal data, or by email to the address: at any time and without giving reasons that the carrier permanently or temporary stops using his personal data and data about purchases made. In this case the carrier will, within 15 days from receipt of the demand, stop using the personal data and data about purchases for the stated purposes, and notify the card holder, who demanded this, within the next five days. For the judgement of legal relations between Thermana d.d. and the cardholder Slovenian law is used. In the case of questions, please contact our Data Protection Officer for details regarding data protection: . the blue card is also issued to persons who wish to benefit from contractual discounts of clubs, unions or other companies, whose members they are. A Blue Card can get natural persons over 15 years of age, who correctly fill out the form for the issue of the card. For the Golden Card it is necessary to pay a subscription fee each year, which is decided on at the beginning of each calendar year, while the Blue Card is free of charge. At each use of the card, data about the purchase of the cardholder is written to the card system (product resp. service, price of the product resp. service, height of the purchase). With the entry of his personal information on the web page and filling out the field on the web page, referring to the approval of using personal information (i.e. by entering a tick into the field) respectively oy entering personal information into the written registration form, as well as signing the declaration referring to the approval of using personal information, the cardholder gives his personal permission and approval, that all personal information, referring to him, and which are or will become known when operating the card, on the part of the carrier of the personal data, i.e. the company Thermana d.d., company of well- being, Zdraviliška cesta 6, 3270 Laško, may be restored, collected, managed, used, processed and saved for the purpose of marketing services, promotional activities, inclusive direct marketing and analysing operations with the card as well as analysing shopping habits. In Thermana Laško we wish to reward your trust and loyalty, therefore we created the club concept. In the context of Thermana Club we offer you attractive discounts even at your first visit and want to encourage you to do something for yourself more often. Within the Thermana Club you can choose between the Gold and the Blue Thermana Club card, the Vodomček Club is intended for children up to 15 years. Anyone who respects the culture of a healthy lifestyle and in order to maintain health and improve mental and physical abilities regularly benefits from a wide range of services of the company Thermana d. d. and the Thermana Club. The Gold and Blue Card may be obtained by anyone who is older than 15 years. at the reception of Physiotherapy in the Hotel Zdravilišče Laško. if they are holders of a valid Blue Card (one Blue Card, one free parking card) and they've gathered services in the amount of 40 € on the day of the purchase on their bill. To the holders of a valid Gold Card using hotel services (full board, half board, bed and breakfast, daily rest) free parking up to 12 hours or 50 % discount on parking up to 24 hours (one day) is recognized. To the holders of a valid Blue Card using hotel services (full board, half board, bed and breakfast, daily rest) or 20 % discount on parking up to 24 hours (one day) is recognized.